1. Exercise – Participating in a regular exercise routine, such as simply going for a 20 minute walk is chemically good for you. Researchers say the more you exercise the more your brain releases neurotransmitters known as endorphins, a.k.a “happy hormones” (Bora, 2011). These happy chemicals are released into the bloodstream and reduces the stress hormone cortisol, which causes high blood pressure, blood sugar imbalances, and impaired cognitive functionings (Scott, 2011). In short, move, move, move your way towards happiness. 2. Eat Healthy – According to the Mayo Clinic, eating foods rich in omega-3 fatty acids, tryptophan, and B vitamins increases the Happy meter (Nelson, 2009). Omega-3s can be found in fish, nuts, and seeds. Tryptophans are present in bananas, turkey, and lean red meats (Rich, 2011). Eating plenty of leafy greens, dairy, and lean meats will provide the B vitamins to help boost your mood (Cohen, 2010). Let your hunger lead you to happiness in a healthy way. 3. Discover and Learn – Finding new places and learning something new always excites the brain and engages the happy mood. When you find things of interest you help your mind focus on something other than negative thoughts and worries. It’s also exciting when you are learning and growing in a new skill. Tap into your travel bug or pick up a new hobby to get happy. 4. Connect and Help Others – Fostering those relationships that are closest to you helps you stay connected to your happiness, especially when making happy memories with those you love. When you have a sense of comradery with others you gain a sense of belonging, which gives you peace of mind that you are not alone. Even more important, when you help others you not only give happiness to them you also give happiness to yourself (see Can I help you?). Hang out with your best friend or help someone carry their groceries to boost your happiness. 5. Relax and Breathe – Sit in silence and focus on your breathing to become happier. Your busy lifestyle prevents you from settling down to the point where you can just be. Make it a point to calm down from the hustle and bustle using muscle relaxation techniques. Check out Progressive Muscle Relaxation Techniques at Livestrong.com. Deep breathing exercises used in Yoga or Tai Chi is also a great way to calm yourself. Grab a comfy spot, relax your mind and body, and focus on your breathing to reach Zen happiness. 6. Laugh– Finding the funny side of life will give you a healthy dose of happiness. Watch a funny show or just be plain silly to boost your happy scale. When you laugh you distract yourself from all the stresses in your life and give yourself an increase in endorphins and other neurotransmitters that regulate mood. See The Benefit of Laughter – How Laughter Can Reduce Stress and Increase Health to learn more. Smile, be silly, and laugh yourself all the way to your happy place. 7. Be Grateful – Appreciate what you have and let those things be the source of your happiness. A supportive family, good health, a steady job, and being able to walk and talk are all things to be happy for. When you appreciate what you have instead of resenting what you don’t have your perspective on life becomes more positive. Count your blessings and be happy. 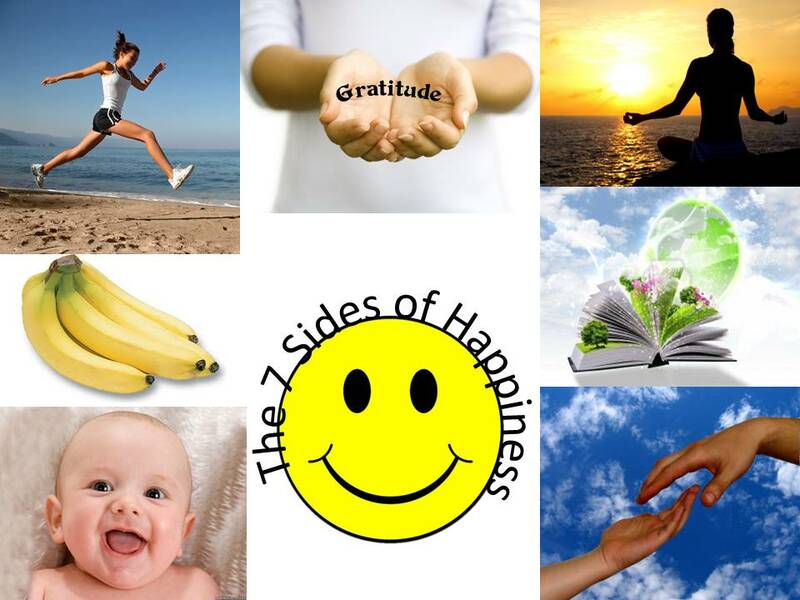 These 7 sides of happiness is part of what you could do to maintain a healthy state of being. Preserve your happiness through regular exercise, eating healthy, laughing regularly, and learning to just relax and breathe when you need to. Happiness is also primed up when you focus on your strengths and use those strengths to discover and learn new things, connect and help others, and appreciate what you have in your life. Happiness is also a matter of perspective and when you see the positive in every situation you will be more than likely be much happier in the long run. Gallery | This entry was posted in Be the Change Lifestyle and tagged Best Medicine, Breathe, Charity, Deep breathing, Eat Healthy, Exercise, food, Gratitude, Grow, Happiness, Happy, Help, Laughter, Learn, Lifestyle, Meditate, Omega-3, Perspective, postaday, Relax, Strength, Stress Management, Tryptohan, Vitamin B. Bookmark the permalink.